An original letter of correspondence between brothers and business partners Joshua Coffin Chase and Sydney Octavius Chase. Topics discussed in the letter include a letter from W. W. Wood, the possibility of filing a spray damage claim and other loss claims at Isleworth Grove, and the expected arrival of H. L. Frost around January 15th, 1931. 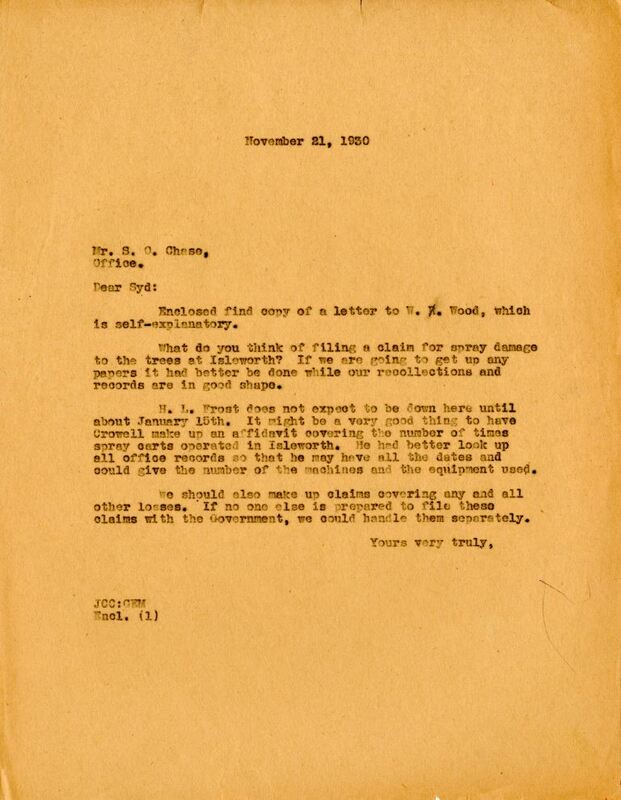 Original letter from Joshua Coffin Chase to Sydney Octavius Chase, November 21, 1930: box 49, folder 20.84, Chase Collection (MS 14), Special and Area Studies Collections, George A. Smathers Libraries, University of Florida, Gainesville, Florida. 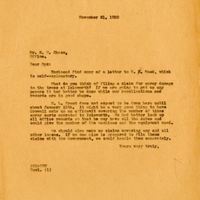 Digital reproduction of original letter from Joshua Coffin Chase to Sydney Octavius Chase, November 21, 1930. Enclosed find copy of a letter to W. R. Wood, which is self-explanatory. What do you think of filing a claim for spray damage to the trees at Isleworth? If we are going to get up any papers it had better be done while our recollections and records are in good shape. H. L. Frost does not expect to be down here until about January 15th. It might be a very good thing to have Crowell make up an affidavit covering the number of times spray carts operated in Isleworth. He had better look up all office records so that he may have all the dates and could give the number of the machines and the equipment used. We should also make up claims covering any and all other losses. If no one else is prepared to file these claims with the Government, we could handle them seperately. Chase and Company; Chase, Joshua Coffin; Chase, Sydney Octavius; citrus; citrus grove; citrus industry; Crowell, S. M.; Frost, H. L.; grove; insurance; Isleworth Grove; loss claim; spray damage; Windermere; Wood, W. W.; Wood, W.W.
Chase, Joshua Coffin. “Letter from Joshua Coffin Chase to Sydney Octavius Chase (November 21, 1930).” RICHES of Central Florida accessed April 19, 2019, https://richesmi.cah.ucf.edu/omeka/items/show/2737.